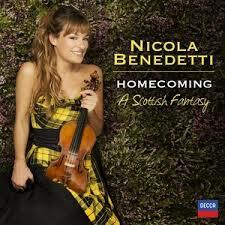 Scottish-Italian violinist Nicola Benedetti’s recording, Homecoming: A Scottish Fantasy, released on July 4, has made it to number 19 on the UK pop charts. The CD features traditional Scottish folk music like The Bonnie Banks o’ Loch Lomond, as well as German composer Max Bruch’s Scottish Fantasy, Op. 46. If you’re looking for authentic Scottish fiddle playing, you may be disappointed, but all in all this seems like a fun and eclectic recording. Benedetti talks about the recording here, here and here. Listen to samples here. Is she a real violonist, or a marketing thing just able to make cross-over recordings ?? ?